Click Here to print out the Pro-Life Voter Information to take with you to the polls and to share with friends and family. Tuesday November 6th is the General Election, when the Governor of California, all 53 Congressional Districts in CA, 20 of the 40 state Senate seats, and all 80 state Assembly seats will be voted on. This is a very important election! Listed below are the Californians for Life Recommendations for Pro-Life Voters. Make sure everyone you know is registered to vote, with your current address and name! You can easily Register to Vote on-line at this Secretary of State website. Find out which Congressional District, which state Assembly District and state Senate District you live in so that you can identify which candidate to vote for from the list below. 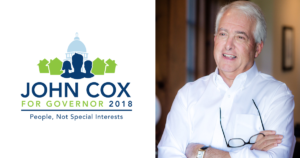 John Cox is fervently pro-life. He is polling well and has funds for a successful statewide campaign for Governor. If there is ONE THING you can do to protect life in our state, it is to elect a pro-life Governor, who can veto all of the terrible attacks on faith, life, and family coming through our pro-abortion state legislature. We desperately need Steven Bailey for Attorney General. Our current Attorney General, Xavier Becerra, has attacked our life-affirming Pregnancy Clinics. INSURANCE COMMISSIONER: Steve Poizner Former State Insurance Commissioner, Technology Executive. Steve is not pro-life, but much better than the other candidate. U.S. SENATOR: Both Democrats are pro-abortion. organized by county, prepared by Craig Huey. District 1: Doug LaMalfa Pro-Life Congressman and farmer whom we need to support! District 3: Charlie Schaupp Farmer, Retired USMC Lt Colonel. Charlie is running against very pro-abortion Democrat Congressman John Garamendi who is so pro-abortion that Congressman Garamendi even voted AGAINST protecting babies beyond 20 weeks of pregnancy. District 4: Tom McClintock Pro-Life Congressman whom we need to support! District 7: Andrew Grant Businessman & Afghan War Veteran. Andrew is running against very pro-abortion Democrat Congressman Ami Bera, who is so pro-abortion, Congressman Bera even voted AGAINST protecting babies beyond 20 weeks of pregnancy! District 8: Paul Cook Pro-Life Congressman whom we need to support! District 9: Marla Livengood Legislative Analyst, Former Lobbyist & Congressional Aide for Richard Pombo. Marla is running against pro-abortion Democrat Congressman Jerry McNerney, who is so pro-abortion that he even voted AGAINST protecting babies beyond 20 weeks of pregnancy. District 10: Jeff Denham Pro-Life Congressman. His challenger is a pro-abortion Democrat who supports abortion through all nine months, so make sure all of your friends vote for Pro-Life Congressman Jeff Denham. This race will determine whether a pro-life majority is retained in the House of Representatives. District 15: Rudy Peters is a pro-life candidate running against pro-abortion incumbent Democrat Eric Swalwell, who is so pro-abortion, Congressman Swalwell even voted AGAINST protecting babies beyond 20 weeks of pregnancy. District 16: Elizabeth Heng Grew up in Fresno, graduated from Stanford and Yale, worked for the US House of Representatives Foreign Affairs Committee. Elizabeth came close to defeating long-term pro-abortion incumbent Jim Costa in the June Primary. Congressman Costa is so pro-abortion that he even voted AGAINST saving babies beyond 20 weeks of pregnancy. District 21: David Valadao Pro-Life Congressman whom we need to support! District 22: Devin Nunes Pro-Life Congressman whom we need to support! District 23: Kevin McCarthy Pro-Life Congressman whom we need to support! District 25 Steve Knight Pro-Life Congressman. His challenger is very pro-abortion, endorsed by the abortion industry giant Planned Parenthood. Make sure you tell all of your friends to vote for Congressman Steve Knight. This is a very tight race and the outcome will determine whether a pro-life majority is retained in the House of Representatives. District 26: Antonio Sabato Antonio is running against pro-abortion Democrat Congresswoman Julia Brownley, who is so pro-abortion that she even voted AGAINST protecting babies beyond 20 weeks of pregnancy. District 30: Mark Reed Realtor and Rancher. Mark is running against pro-abortion Democrat Congressman Brad Sherman. Congressman Sherman is so pro-abortion that he even voted AGAINST saving babies beyond 20 weeks of pregnancy. District 31: Sean Flynn College Professor, Economist & Author. Sean is running against pro-abortion Democrat Congressman Pete Aguilar. Congressman Aguilar is so pro-abortion that he even voted AGAINST saving babies beyond 20 weeks of pregnancy. District 35: Christian Valiente Janitorial Cleaning Contractor & Army Veteran. Christian is running against pro-abortion Democrat Congresswoman Norma Torres. Congresswoman Norma Torres is so pro-abortion that she even voted AGAINST saving babies beyond 20 weeks of pregnancy. District 36: Kimberlin Brown Pelzer Actress, Farmer & Businesswoman. Kimberlin is running against pro-abortion Democrat Congressman Raul Ruiz. Congressman Ruiz is so pro-abortion that he even voted AGAINST saving babies beyond 20 weeks of pregnancy. District 39: Young Kim Former Assemblywoman & Former Congressional Aide for Ed Royce. Young Kim is running against very pro-abortion challenger Gil Cisneros- Gil Cisneros is endorsed by the abortion industry. This will be a very tight race and the outcome will determine whether we retain a pro-life majority in the House of Representatives. Please do everything you can to promote and support Young Kim for Congress in District 39. District 41: Aja Smith Federal Employee & USAF Veteran. Aja is running against pro-abortion Democrat Congressman Mark Takano. Congressman Takano is so pro-abortion that he even voted AGAINST saving babies beyond 20 weeks of pregnancy. District 42: Ken Calvert Pro-Life Congressman whom we need to support! District 43: Omar Navarro Businessman. Omar is running against pro-abortion Democrat Congresswoman Maxine Waters. Congresswoman Waters is so pro-abortion that she even voted AGAINST saving babies beyond 20 weeks of pregnancy. District 45: Mimi Walters Pro-Life Congresswoman whom we need to support! Congresswoman Walters is being challenged by a pro-abortion Democrat, who is endorsed by the abortion industry. This is a very close race. Please share this information with everyone you know in Congressional District 45 to re-elect Pro-Life Congresswoman Mimi Walters! We may lose the pro-life majority in the House of Representatives if Congresswoman Walters is not re-elected. District 47: John Briscoe is running against pro-abortion Democrat Congressman Alan Lowenthal. Congressman Lowenthal is so pro-abortion that he even voted AGAINST saving babies beyond 20 weeks of pregnancy. District 48: Dana Rohrabacher Pro-Life Congressman whom we need to support! This will be a very close race as Pro-Life Congressman Rohrabacher is being challenged by a very pro-abortion Democrat candidate who is endorsed by the abortion industry. If we lose this seat, we may lose the Pro-Life majority in the US House of Representatives. District 49: Diane Harkey Former Assemblymember and Board of Equalization Member. Diane Harkey deserves our full support as she is running against a very strong pro-abortion Democrat candidate who is endorsed by the abortion industry. This will be a very close race and we all need to promote and support Diane Harkey for Congress. If she loses this race, we may lose the Pro-Life majority in the US House of Representatives. District 50: Duncan Hunter Pro-Life Congressman. It is important we retain a Pro-Life Majority in the US House of Representatives. District 51: Juan Hidalgo Jr. Retired USMC Sergeant Major. Juan Hidalgo is very pro-life and is challenging a very pro-abortion Democrat Congressman Juan Vargas who is so pro-abortion that Congressman Vargas even voted AGAINST saving babies beyond 20 weeks of pregnancy! District 53: Morgan Murtaugh Journalist & Conservative Activist- she is not strongly pro-life, but certainly better than the NARAL and Planned Parenthood endorsed, 100% pro-abortion incumbent Democrat Congresswoman Susan Davis. Congresswoman Susan Davis is so pro-abortion that she even voted AGAINST saving babies beyond 20 weeks of pregnancy! State Senate District 16: Shannon Grove is a Pro-Life candidate deserving of your support! State Senate District 38: Brian Jones is a Pro-Life candidate deserving your support! Assembly District 1: Brian Dahle is a Pro-Life Assemblymember deserving of your support. Assembly District 3: James Gallagher is a Pro-Life Assemblymember deserving of your support. Assembly District 5: Frank Bigelow is a Pro-Life Assemblymember deserving of your support. Assembly District 6: Kevin Kiley is a Pro-Life Assemblymember deserving of your support. Assembly District 8: Melinda Avey is running against pro-choice Assemblymember Ken Cooley. Assemblymember Ken Cooley has been given a 100% rating by the abortion giant Planned Parenthood. Assembly District 12: Heath Flora is a Pro-Life Assemblymember deserving of your support. Assembly District 23: Jim Patterson is a Pro-Life Assemblymember deserving of your support. Assembly District 26: Devon Mathis is a Pro-Life Assemblymember deserving of your support. Assembly District 29: Vicki Nohrden is running against 100% pro-abortion Democrat incumbent Mark Stone who is endorsed by the abortion giant Planned Parenthood. Assemblymember Stone is so pro-abortion that he even voted for SB 320, which would have forced our universities to become abortion clinics! Make sure everyone votes for Vicki Nohrden for Assembly District 29! Assembly District 31: Lupe Espinoza is running against 100% pro-abortion Democrat incumbent Joaquin Arambula who is endorsed by the abortion giant Planned Parenthood. Assemblymember Arambula is so pro-abortion that he even voted for SB 320, which would have forced our universities to become abortion clinics! Make sure everyone votes for pro-life Lupe Espinoza for Assembly District 31! Assembly District 32: Justin Mendes is running against abortion giant Planned Parenthood endorsed Rudy Salas. Make sure everyone votes for Justin Mendes for Assembly District 32! Assembly District 33: Jay Obernolte is a Pro-Life Assemblymember deserving of your support. Assembly District 34: Vince Fong is a Pro-Life Assemblymember deserving of your support. Assembly District 35: Jordan Cunningham is a Pro-Life Assemblymember deserving of your support. Assembly District 36: Tom Lackey is a Pro-Life Assemblymember deserving of your support. Assembly District 38: Dante Acosta is a Pro-Life Assemblymember deserving of your support. Assembly District 39: Ricardo Benitez is pro-life and is running against a candidate endorsed by the abortion industry, Luz Maria Rivas. Assembly District 40: Henry Gomez Nickel is pro-life and is running against a candidate endorsed by the abortion industry giant Planned Parenthood, James Ramos. Assembly District 44: Ronda Baldwin–Kennedy is pro-life and running against abortion industry endorsed Jacqui Irwin. Assemblymember Irwin is so pro-abortion that she even voted for SB 320, which would have forced our universities to become abortion clinics! Help elect pro-life Ronda Baldwin-Kennedy to Assembly District 44! Assembly District 46: Roxanne Beckford Hogue is pro-life and running against abortion industry endorsed Adrin Nazarian. Assemblymember Nazarian is so pro-abortion he even voted to support SB 320, which would have forced our universities to become abortion clinics. Help elect Roxanne Beckford Hogue to Assembly District 46! Assembly District 49: Burton Brink is pro-life and running against abortion industry endorsed Ed Chau. Assemblymember Chau is so pro-abortion he even voted to support SB 320, which would have forced our universities to become abortion clinics. Assembly District 52: Toni Holle is pro-life and running against abortion industry endorsed Freddie Rodriguez. Assemblymember Rodriguez is so pro-abortion he even voted to support SB 320, which would have forced our universities to become abortion clinics. Assembly District 55: Phillip Chen is a Pro-Life Assemblymember deserving of your support. Assembly District 56: Jeff Gonzalez is pro-life and running against abortion industry endorsed Eduardo Garcia. Assemblymember Garcia is so pro-abortion he even voted to support SB 320, which would have forced our universities to become abortion clinics. Help elect Jeff Gonzalez to Assembly District 56! Assembly District 57: Jessica Martinez is pro-life and running against abortion industry endorsed Ian Calderon. Assemblymember Calderon is so pro-abortion he even voted to support SB 320, which would have forced our universities to become abortion clinics. Help elect Jessica Martinez to Assembly District 57! Assembly District 60: Bill Essayli is pro-life and running against abortion industry endorsed Sabrina Cervantes. Assemblymember Cervantes is so pro-abortion she even voted to support SB 320, which would have forced our universities to become abortion clinics. Help elect Bill Essayli to Assembly District 60! He won in the June Primary! Assembly District 65: Alexandria Coronado is pro-life! Help elect Alexandria to Assembly District 65! Assembly District 66: Frank Scotto is pro-life and running against abortion industry endorsed Al Muratsuchi. Assemblymember Muratsuchi is so pro-abortion he even voted to support SB 320, which would have forced our universities to become abortion clinics. Help elect Frank Scotto to Assembly District 57! Assembly District 67: Melissa Melendez is a Pro-Life Assemblymember deserving of your support. Assembly District 68: Steven S. Choi is a Pro-Life Assemblymember deserving of your support. Assembly District 71: Randy Voepel is a Pro-Life Assemblymember deserving of your support. Assembly District 72: Tyler Diep is pro-life! Assembly District 73: William Brough is a Pro-Life Assemblymember deserving of your support. Assembly District 74: Matthew Harper is a Pro-Life Assemblymember deserving of your support. Assembly District 75: Marie Waldron is a Pro-Life Assemblymember deserving of your support. Assembly District 79: John Moore is Pro-Life and would be a better Assemblymember than the very pro-abortion Shirley Weber who is endorsed by Planned Parenthood. Assemblymember Weber is so pro-abortion, she even voted yes on SB 320, which would have required our universities to become abortion clinics.